The Philippines is said to have one of the most progressive energy laws in the world as manifested by the Electric Power Industry Reform Act of 2001 or EPIRA, the Renewable Energy Act of 2008, and the Biofuels Act of 2006. Notwithstanding, the Philippines faces a gamut of energy challenges including having one of the highest electricity prices in the world, high consumption of fossil fuel, and heavy reliance on foreign fuel. Almost all of imported coal, which constitutes about 70 % of the country’s coal consumption, comes from Indonesia. The Philippines consumes over 14 Mtoe of oil and oil products that is mostly used for transportation (over 54%). To adhere to its pledge of 70% GHG emissions reduction by 2030 in the recently held COP21 in Paris, big changes must be to shift to less carbon intensive energy options while ensuring least energy cost. These changes must be based on sound analysis of the interplay of technology, markets, behavior, and policy and must involve the participation of major stakeholders. 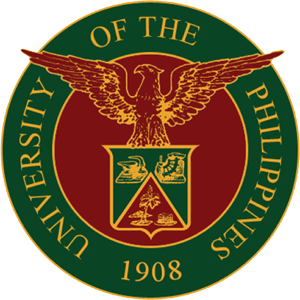 The University of the Philippines Sustainable Energy Program (UP SEP) aims to create, organize, and promulgate a reputable body of knowledge that can guide energy policy-making in the Philippines with an eye towards enabling Filipinos to meet their present energy needs while ensuring that future generations of Filipinos will be able to meet their own. UP SEP aims to become a national and global resource for integrating existing and future works, disseminating information among diverse audience, and formulating questions and solutions towards innovative and sustainable energy system solutions, with a focus on the Philippine energy systems. Inter-disciplinary and multi-sectoral. Energy issues involve a complex interplay between technology, society, environment, and economy across different time horizons. UP SEP recognizes the need to engage minds from different disciplines and various sectors of the society (i.e., academe, government, and private) to gain better understanding of the country’s energy problems and identify how each discipline and sector may contribute to sustainable Filipino energy systems. Question-based. The program recognizes the value of starting efforts with first making sure that the right questions are asked and that these questions drive solution-generation instead of prevailing technology- or discipline-based approaches. Intergenerational. The program gives importance to generational continuity for energy solutions and thereby puts emphasis on preparing students at all levels to tackle energy system problems. Technology. Fossil-fuel, renewable, and alternative fuel energy technology options. Market and Behavior. Market and behavioral mechanisms that influence energy cost and consumption. Public Policy. Laws, regulations, and other policy instruments that govern the power and transportation sectors. 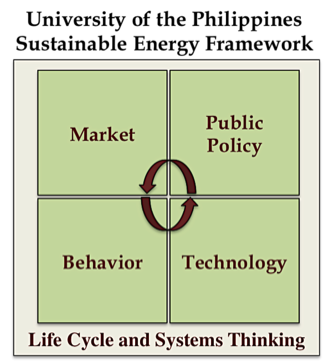 Life cycle and sustainability thinking. Considering life cycle economic, environmental, and social implications in assessment and design of Filipino energy systems. UP SEP office is currently located at Room 327 Melchor Hall, University of the Philippines, Diliman, Quezon City.